Happy Holidays!! It is the time to be thankful, to remember our loved ones, to sing carols, and to most importantly… GIVE! And sometimes we are so caught up in baking or singing or last minute shopping for decorations we forget a thoughtful present. Lucky for you, and the gift-receiver, Rainbow Watersports has a GIFT CARD! This Gift Card is the best present for 3 simple reasons. 3) Whoever receives this Gift Card gets an unforgettable memory on the water on the North Shore- BECAUSE OF YOU!! 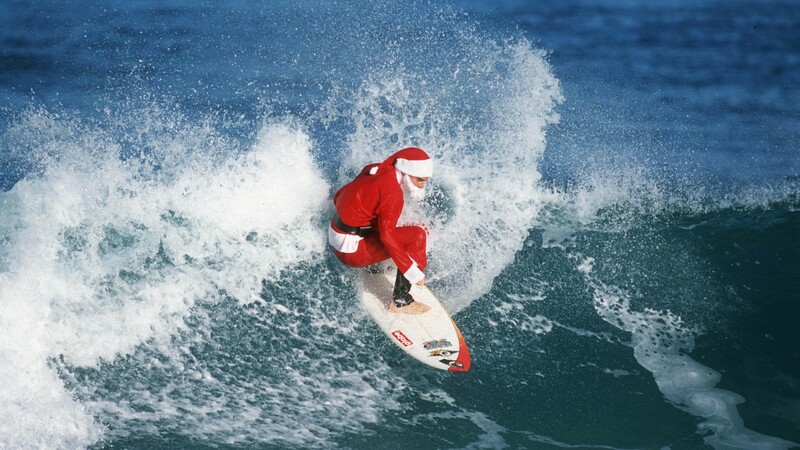 Now I know this is a picture of a Santa Surfing (courtesy of HDW website) , but nonetheless ’tis the season to get on a Stand Up Paddle Board and enjoy the water with loved ones or give them the opportunity to experience the fun! You can order them online on our homepage or very easily call us and we can set one up to your specific needs!